Stainless steel fasteners - bolts, screws, nuts, etc. We are a supplier of a full range of push-on elements, such as self-clinch nuts, self-clinch studs and self-clinch standoffs. Our catalogue cards can be found under the offer tab. We offer carbon steel and stainless steel A2 and A4 toogles from our warehouse or upon order. We also manufacture toogles according to custom drawings. You are also invited to submit enquires for all other types of fasteners. We will supply the required products to your site within a specific deadline offering competitive prices. The products available in our warehouse can be supplied within 24-48 hours throughout Poland. If we don’t have a given product in stock, we will source it for you in Poland or abroad. Feel free to browse our online shop. 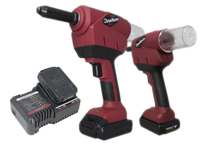 battery riveting tools and pneumatic riveters. Our company manages a factory-authorised pneumatic and hydraulic riveter repair service as well as manual riveters supplied by HONSEL. 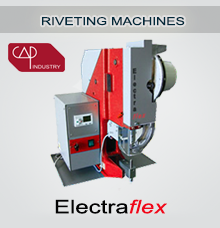 We represent the Italian company Capmac Industry produces automated machinery and equipment riveting. As the only distributor of VVG / HONSEL tools, we are looking for commercial partners – local shops and wholesalers in Poland. Rivets | Bolts | Copyright © 2006-2019 NIROSTAL Sp. z o.o.